Are you ready to put your personal L.O.V.E. style to work? The L.O.V.E. 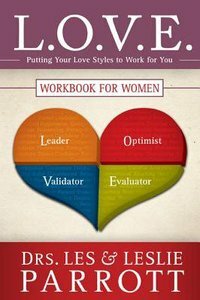 Workbook for Women, by Drs. Les and Leslie Parrott, is an effective tool for doing just that. Ideal for individual or group study, this workbook takes the content in L.O.V.E. to a more personal level, where the payoffs are abundant. The insights you gained from reading L.O.V.E. (and taking the online assessment) remain as flat as the printed page if you don't apply them to your relationship. That's why this workbook is chock-full of quick and easy ways to personalize this experience. The L.O.V.E. Workbook for Women contains: * Discussion starters that are sure to help you understand and be understood * Fun exercises---geared specifically to your personalities---that reveal new insights about your marriage * Built-in guide for use with the optional four-session DVD (ideal for small groups) * Exercise kit for your online assessment Use the practical tools found in this workbook as you read L.O.V.E., and you'll learn how to express love to your husband---and feel truly loved by him in return.